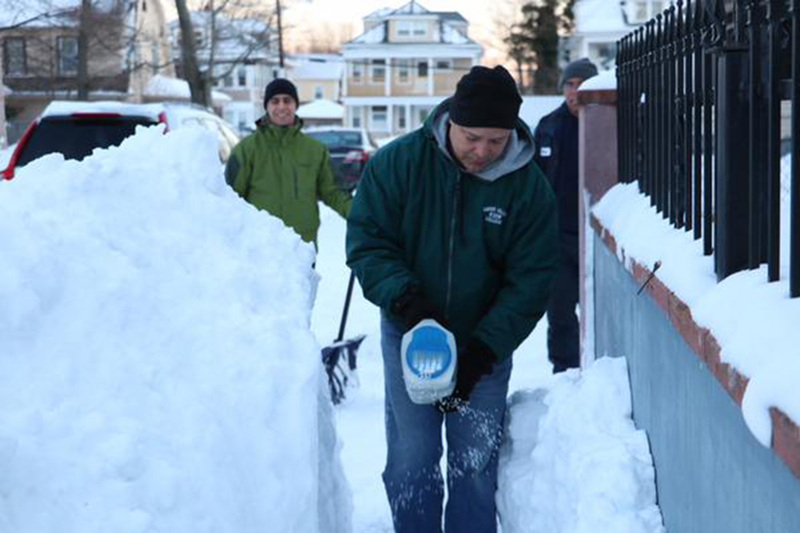 Mayor Elorza and State Senator Pichardo shoveling snow last week. Photo from Twitter. This is what a lot of people have been calling for, the City shoveling, or paying someone to shovel, then billing the property owner. Of course, it will still be awkward when the City has to bill itself. This is great news! I love when something good can be reported on. I’m envious of Providence,, living in North Providence, our Mayor was quoted in our local paper saying he was “uncomfortable” enforcing our sidewalk ordinances, (he did ask for voluntary cooperation.) That message got out, few sidewalks here are done including sidewalks adjacent to town property including Evans Field (on Smith St, Fruit Hill Avenue) and Stephen Olney Park (High Service, Smithfield Rd) – also some big companies failed to clear such as Citizens Bank. Many businesses piled up the snow from their private parking lots onto the public sidewalk leaving piles that look as they they will last forever. Our bus shelter on Smith by the Fruit Hill Park and ride was totally blocked and useless. No effort at most bus stops to safely help passengers who evidently count for very little. On the other hand, a few businesses and institutions (RIC, VFW, St James Episcopla Church, Rossi’s, Dave’s Furniture, Christensen’s Dairy, Yacht Club…) did do the sidewalks showing it can be done. Barry, any idea how Milwaukee deals with violators that do not participate in the property tax system – like churches and schools? Not News = Meetings and Talk about new law to replace existing, yet to be enforced law. According to a comment on Facebook, State Senator Maryellen Goodwin and State Rep. Chris Blazejewski are set today to introduce Bills to mandate that RIDOT clear snow from sidewalks on overpasses under their jurisdiction. This stems from RIDOT being asked to clear snow from the sidewalk on the Smith Street overpass and responding that they didn’t really feel like doing it.